The very first CTR image results from the MAX IV control room. The “donut” shape is critical to the development of the new bunch length diagnostic. 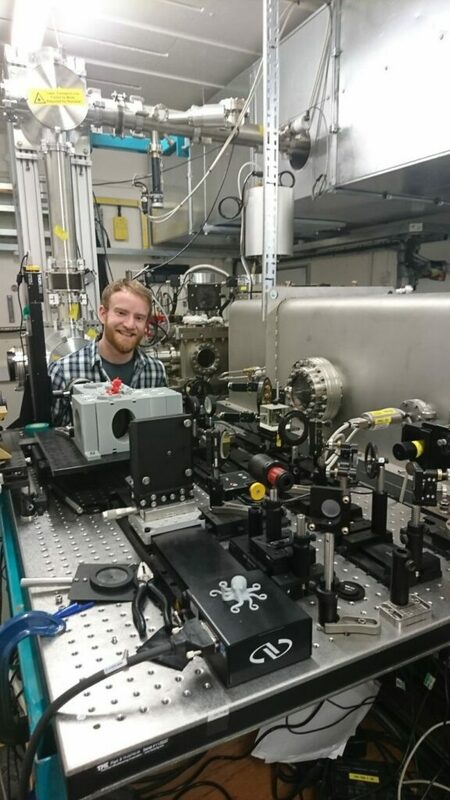 A group of PhD students from the Cockcroft Institute have recently returned from an extremely successful measurement program at the MAX IV synchrotron in Lund, Sweden. 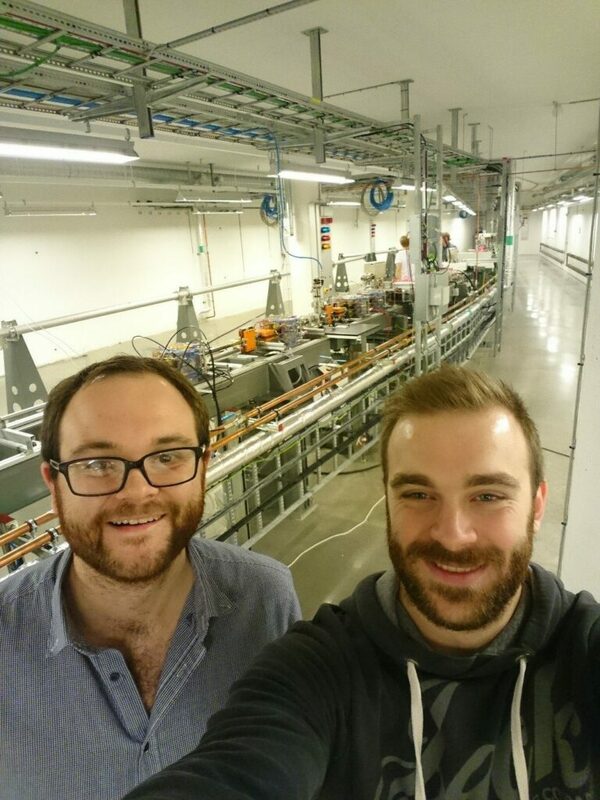 Joe Wolfenden (University of Liverpool), Bill Kyle (University of Manchester), and Tom Pacey (University of Manchester) have been working at the centre of a new collaboration with MAX IV on a new diagnostic for their “Short Pulse Facility”. Joe and Bill in the SPF beam tunnel. The beamline and the experimental area can be seen in the background. Joe’s research focusses on new imaging-based techniques for particle accelerator diagnostics. His work use radiation generated by a charge particle beam, and spans both transverse and longitudinal measurements for the next generation of machines. Bill’s research is based on simulating and measuring the interactions between radiation generated by a charged particle beam and the beam itself. He hopes to measure the effect of these interactions and compare them with the results of a novel simulation model. One of Tom’s research interests is on the development of diagnostics which work in a specific frequency range known as terahertz (THz). He can use these techniques to measure the properties of a charged particle beam after it has passed through metallic and dielectric structures. Tom in Beam Area 1 at the STFC CLARA facility. In front of him is one of his THz-based diagnostics. The same principles behind this setup have been used in the MAX IV setup. Their measurements at MAX IV were actually a special type of imaging, just as anyone else would do with a digital camera. However, the average digital camera captures optical light with a wavelength around 0.5 micrometres, whereas here the focus was on much longer wavelengths; up to 3000 micrometres! This light was made by an electron beam, by either hitting a target or bending its path with a magnet. It is known as coherent radiation, because its wavelength is comparable in length to the length of the electron beam that produced it. 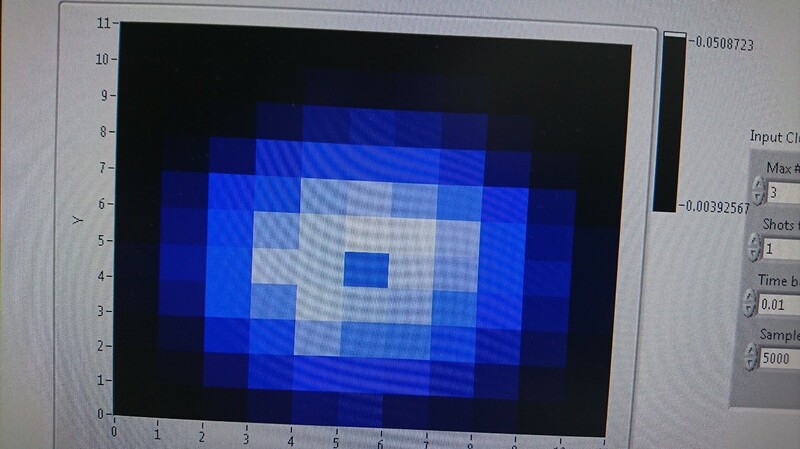 Imaging this coherent radiation showed that it was possible to tell how long the electron beam was from the properties of the image they found. The measurements went extremely well and data is currently being analysed. First results are looking very promising and the group is already planning to head back to MAX IV for more measurements in early 2019! The students had a fantastic time in Lund and want to say a massive thank you to Erik Mansten and Sara Thorin from MAX IV for all their help and enthusiasm, and for inviting them in the first place! This set of measurements will be used to produce a proof-of-principle. The next measurements in 2019 will push this forward to produce an actual diagnostic tool which will be used to run one of the MAX IV beamlines during daily operation!